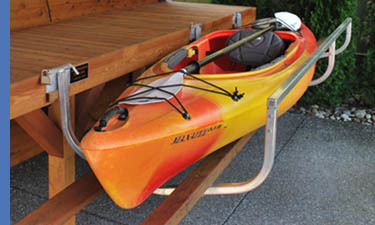 Dock Side Cradle - The easy way to get in and out of your kayak! The idea of the Dock-Side Cradle™ came after the creator, Richard Holmes retiree and his wife Shirley, found it difficult for themselves and their family to enter and exit their kayaks on Lac Le Jeune in British Columbia, Canada. We hope that this product brings a new level of safety and enjoyment to your kayaking and canoeing experience.